The expert and highly experienced team at Hog Roast West London can provide you with a full hog roast catering service that will take the stress and worry out of organising the catering for your event. Your meat will be cooked to absolute perfection and can be flawlessly complemented with our extensive range of handmade side dishes and drinks to wash it all down. There is really nothing quite like a hog roast feast that is provided by Hog Roast West London! Hog Roast West London offers its services to events of all types and sizes including weddings, birthdays, and corporate and charity events. Whatever type of event you are organising, if you need catering – give us a call and we will come up with a package that is perfectly and personally tailored to meet your exact requirements. Not only is a hog roast a beautiful thing to see, but it will also leave your guests feeling full and satisfied which is exactly what you want! Are you organising your wedding and feel uncertain as to which type of catering to choose for your big day? 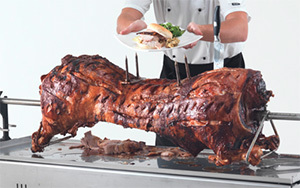 Consider a hog roast feast as it is a visually splendid sight and a culinary delight all rolled into one! Your guests will be amazed at how succulent and beautifully cooked our hogs are and will be bowled over by the extensive selection of side dishes that are available to choose from. Once you have discussed your requirements with us and agreed on a package, you can relax in the knowledge that your wedding catering is in expert and experienced hands. If you have decided to cook your very own hog roast, we can help you out by delivering an easy-to-use hog roast machine complete with gas bottle direct to your door anywhere in the West London area! In addition, you can either provide your own hog or you can choose from any one of our selection of beautifully prepared hogs. Cooking and carving your very own hog is a very satisfying experience and one that is sure to impress your guests – contact us today for more information!